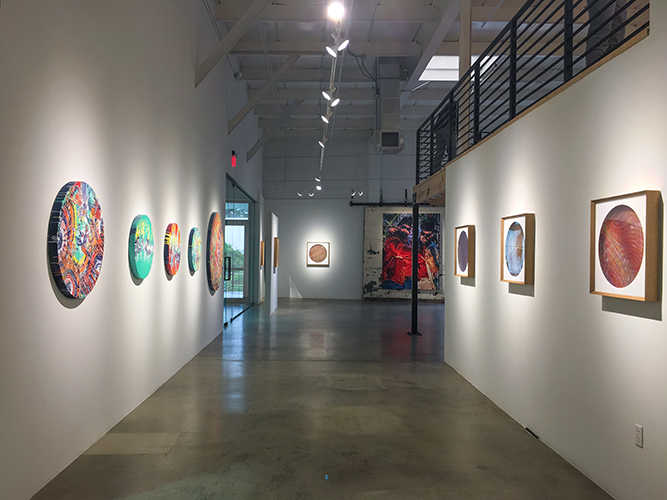 Fabien Castanier Gallery is excited to announce our next group exhibition in Miami, Ciudad Mágica, with new work from artists Hoxxoh, Andrew Antonaccio, and Michael Vasquez. 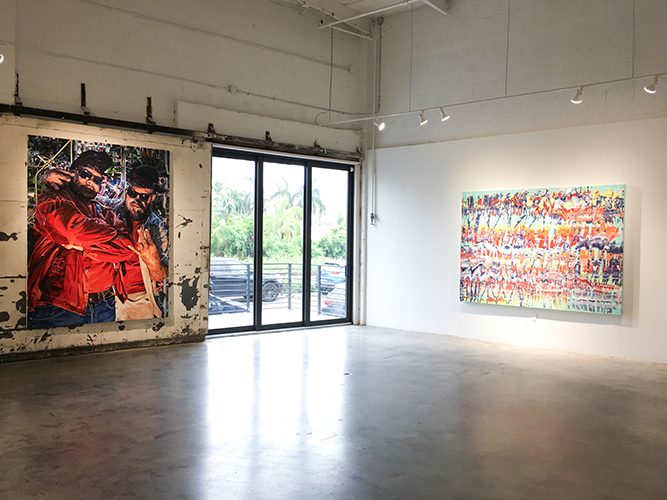 While each artist conveys vastly different styles, they are all based in Miami, creating works inspired by the city’s rich cultural history and dynamic aesthetic. Miami is often referred to as the Ciudad Mágica (the magic city), a nickname born out of the city’s rapid growth. With its burgeoning transformation every year, the Miami art scene continues to evolve and this exhibition presents a focus on three particularly prolific image makers. Douglas Hoekzema (aka Hoxxoh) began as a graffiti and street artist in Miami. Originally part of the MSG graffiti crew, Hoxxoh developed his own style that has evolved into an artistic practice that now adorns commissioned walls all over the city. 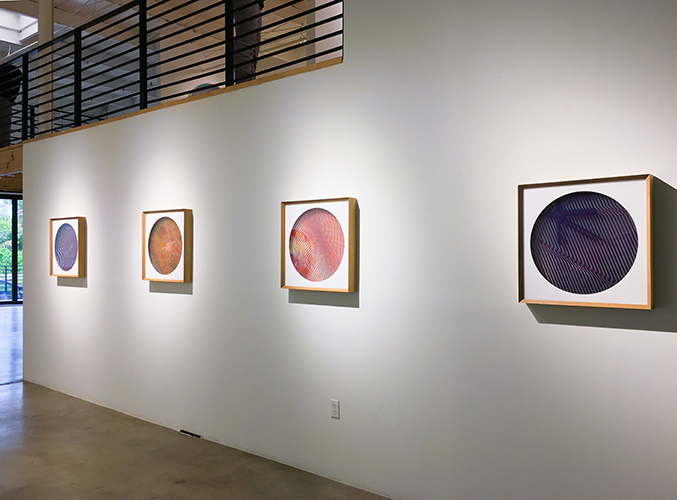 He has mastered multidimensional abstract pieces that combine geometric and linear forms with an organic aesthetic. His new work for this show highlights his technique and mode of creation, investigating an intuitive manipulation of paint on canvas. The compositions are made with a variety of techniques, including a paint pendulum and a method involving the pouring of paint from one flat surface to another. The patterns he creates are moments of controlled chaos, the representation of the mechanisms of time and gravity through pigment. Much of his work is determined by chance and the passing of time, manifested in logarithmic spirals and hypnotizing striations of color. Andrew Antonaccio has become a strong force for urban art in Miami, most known for his black and white linear portraits and colored geometric abstractions created as part of artist duo, 2Alas. Now, Antonaccio presents his personal studio work that focuses on the juxtaposition of traditional aesthetics and the digital medium. He combines archived images with new era or modern photography, creating abstract compositions. Some of his work even factors in an interactive element, in which capturing his pieces digitally will present an alternate appearance on the viewer’s camera. He utilizes this unique characteristic as a commentary on the overwhelming digital experience of our current generation. Michael Vasquez’s work explores a world of misguided youth, subjects who are in search of acceptance and belonging amidst undeserved communities, broken homes, street gangs, and cliques. With his portraits, Vasquez presents groups of “extended families”, governed by their own sets of values and social codes. His work is deeply embedded with signs, symbols, and the performative bravado of his subjects, an examination of the reoccurring themes of masculinity, identity, and community. Vasquez’s work has been exhibited in numerous institutions, including the Smithsonian National Portrait Gallery (D.C.), the MDC Museum of Art + Design (FL), the MOCA North Miami (FL), and the Orlando Museum of Art (FL).